We are delighted to announce we are finalists at the Drum Experience Awards for Retail Brand Activation of the Year. We will be competing among the best retail brand activations of the year thanks to our work with Ted Baker, delivering the 'Colour By Numbers' Old Street Pop Up. It is a well-deserved nomination, as our team worked tirelessly to produce an eye-catching pop-up featuring a clean, monochrome colour scheme and using modern materials and shapes. Having captured the attention of thousands of customers and the media, it has now been rewarded with this prestigious industry nomination. The winners of the Drum Experience Awards will be announced on the 4th of December at Marriott Grosvenor Square in London. 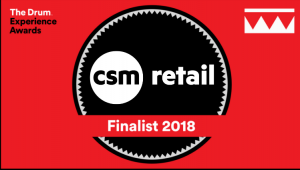 As part of CSM Live, we are up for a total of 5 awards.